Is it time for a new BMX frame and you want something unique? 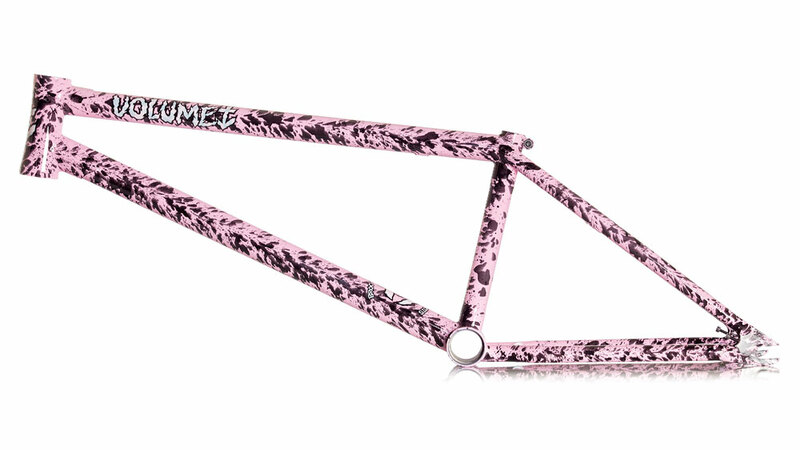 Get a look at the new Broc Raiford signature Vessel V3 frame from Volume Bikes in this new “Disco Stew” pink with black splatter. Disco Stew is the video project / crew that Broc worked with Josh Clemens on and this frame came through with the project. The Vessel V3 frame is made from full 4130 chromoly tubing with a 75° head tube angle, 71° seat tube angle, 11.7″ bottom bracket height, 9.25″ standover height and a 13.25″ chainstay length (Slammed). The frame features an hourglass shaped Integrated head tube, gussets on the top and down tubes, a butted seat tube, a Mid bottom bracket, integrated seat post clamp, curved seat and chain stay bridges, plenty of clearance for 2.40″ tires, Investment Cast dropouts with integrated chain tensioners and removable seat stay brake mounts. The Disco Stew Vessel V3 is available in 20.75″, 21″ and 21.25″ top tube lengths with a weight of 5 lbs. 2 oz. (20.75″) and a price tag of $345.00. If you aren’t feeling the color, but you like the geometry, you can also find the frame in Black, Raw with Black Splatter and chrome through BMX shops and mail-orders that carry Volume Bikes worldwide now. If you’re curious how it looks built up, check out Broc’s latest Bike Check from Odyssey below!